Total Workshop search results: 23. Displaying Page 1 of your woodworking search phrase TIME OUT CHAIR WOODWORKING PLAN. Build this chair from outdoor friendly wood, like pressure treated or cedar, and it will last a long time. Here are the free plans to build it. Link Type: free plans | Link Source: DesignsByStudioC | Visit the category | Fix Link? The plan says: Springtime is the time to think about the long summer ahead with the ever lasting question of, What can we do now Mom! A strongly constructed playhouse painted with bright trim is a must for the little girls in the family. Even little boys will have fun playing house. This cunning playhouse is 6 feet high, 7 feet long and 4 feet wide, which allows room for a small tableland chairs and dolls and their accessories. you will find that the short time spent in building it was time well spent when the children move in. No more wobbly tables or chairs with this simple to make and use leg-trimming jig. No matter how precisely you cut table legs to length, nor how carefully you glue up the legs, aprons, and top, you four-legged table may still rock or wobble a bit. Here is a simple way to wipe out wobble the first time. Have fun building one of our themed sun chairs. We designed it for the porpoise that you can ease back and relax with a smile on your face. Make the tail stool as a slant for relaxation. Or build it with a flat top so you can stretch your legs straight out, or use as a side table. Full size drawings. Our Maritime Side-by-Each chairs is a fun play on words for these traditional side-by-side Adirondack style chairs. 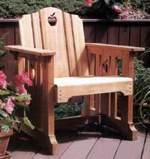 Our full size drawings and instructions show you how to build the adirondack chair. Then simply build another one for the other side, no difference except for the armrest position. Then join them up at an angle like shown, or have them along side each other in a straight line. We also offer two versions of the chair back in this plan, straight across or an arched design. Why not settle back and take-r-easy in our deck lounge chair. The stool is separate and the legs fold up for storage. Build and finish it a number of ways. Use regular deck screws and deck boards, then stain it a color you like. Or build it with cedar or teak and use brass screws, for a visual impact that will make people think you spent hundreds of dollars for you outdoor furniture. Inspired by the Titanic deck chairs. We are proud to present our Maritime arched chaise lounger, with pull out shelf on either side. Featuring an adjustable back that lays flat, the chaise lounge uses standard size lounge chair cushions available in department and home improvement stores. Cushion space is 27 x 82 inches. Full size drawings! Have fun building one of our clearly Canadian Maple Leaf chairs. With plenty of elbow room, we designed it for Canucks and Snowbirds. Make the classic red and white chair or get your hockey fix by putting a wood stain on the armrest then paint on some black and grey stripes! We think we scored with this design! Build the stool with the slant top so you can stretch your legs straight out, or with a flat top and use as a side table. For added comfort, consider adding on rocker blades ... its all included in our design! Full size drawings. We are very proud to offer our West Coast Fish Chair inspired by Haida art. And if you want, you can also convert it a rocker. Stool plan is also included. We provide everything you need in full size drawings; all the parts, paint diagrams and instructions to make the chair. Seat width 23-1/4 inches. Need a custom size? Just let us know. Just like all of our exclusive woodworking designs, these plans include full size drawings. 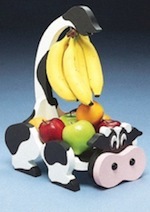 Check out our entire furniture collection. Shown here with our Maritime Clown Fish Kids Chair 05-WC-0627. Our Maritime Blue Tang Chair is made for adults with big hearts. Just like all of our exclusive woodworking designs, these plans include full size drawings. Check out our entire Maritime furniture collection. Overall length includes the stool in place. Shown here with our Maritime Blue Tang adult size chair, we offer our kid size Maritime Clown Fish Chair. The chair has the option to build an adjustable foot rest or you could simply secure the tail to the front of the chair. Front of seat is about 12 inches from the ground and the seat is 16 inches wide. Overall width includes the side fin shelfs. Full size drawings and paint pattern included. 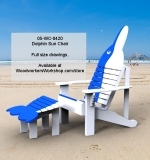 Perfect match with our adult size Maritime Blue Tang Fish Chair 05-WC-0628. Kick back and relax east coast style, with our Maritimes East Coast Fish Chair. Leave the chair all natural wood grain, or have some fun and paint it up like we show here. Even change the colors to shades of grey or your own painting design. Just like all of our exclusive woodworking designs, these plans include full size drawings. Check out our entire Maritime furniture collection. When the opportunity arrives for sitting outdoors on a warm summers evening, relaxation is the goal. Most garden furniture available up to the present time, while designed for sitting or lounging, is far from relaxing. 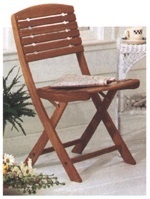 The garden chair shown is different from the general run of this type of furniture as it has been designed for maximum relaxation. All you need is a sheet of plywood and a few lengths of dowel. All you need to buy is a lunge pad measuring about 22 x 78 inches long. This is a vintage woodworking plan. Visit our FAQ page for a full definition. View the Larger Image Slideshow to see the actual item you are buying. The plan says: You will probably have as much fun building this chaise on wheels as you will using it. The adjustable back and form fitting design provides an ideal place to spend your leisure time. The Full Size pattern takes all the mystery out of building. Just trace each pattern on the wood pattern specifies. 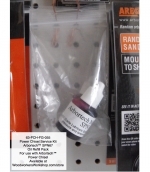 Saw and assemble exactly as the easy to follow, step by step directions indicate. No Special tools or skill required. A complete list of needed materials is included. Spend a little bit of time building one of our Maritime chairs and the work will pay dividends for years to come in the form of relaxation. Build the stool with the slant top so you can stretch your legs out, or with a flat top and use as a side table. 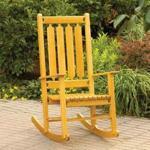 Bonus drawings include rocker blade to convert your chair into a relaxing rocker. Full size drawings. Finished Depth measurement below is for the chair. Stool adds another 14.5 inches. Sometimes simpler is better, and these bar-height table and chairs show how well good looks and clean lines can go together. Link Type: free plans | Link Source: CanadianHomeWorkshop | Visit the category | Fix Link? Being able to get in and out of your house is probably the first and most important thing to address when trying to make your home more accessible. It is a practical matter as well as a personal one, because once you can get in and out of your house more easily you do not feel as trapped and dependent on others. Link Type: free plans | Link Source: HomeTime | Visit the category | Fix Link?